Got a question? Not sure where to start? We’ve got you covered! Get the answers you need with our Author FAQs: Getting Started, Making Your Submission, Submission Delivery, and Managing Your Submissions. How do I set up an account to use ExpressO? To use ExpressO, create an account. Click on My Account, click Sign Up, and complete the form provided. After you receive a confirmation email, click on the link in the email to confirm your account. Now you may begin! You can update your account information at any time, including your email address and/or password, by accessing the Edit Profile link on your My Account page. If you forget your password, please click the Forget your password? link and the system will send you your password immediately by email. If you opt to use the Remember Me option, your password and email address are remembered even after closing your browser so you do not need to log in each time you visit the site. I'm unable to login. Why isn't my password working? Check your spam/trash folder. Occasionally our automated emails are recognized as spam by some email servers. If you are still unable to access your account, please contact expresso-support@bepress.com for assistance. What will I need to do before I start my submission? Set up your ExpressO account. Have your manuscript ready to upload (a cover letter and CV are optional but strongly recommended). Have a credit card handy for payment. We accept VISA, MasterCard or American Express. If your school has an account, then the charges may be either partially or fully covered. To see if your institution has an ExpressO account, please visit our ExpressO Institutional Accounts page. Watch our ExpressO video Tutorials for Authors for step-by-step instructions. How will I know if my school is paying for my submissions? Please check our ExpressO Institutional Accounts list. If your school does have an ExpressO Institutional Account, users are authenticated in either one of two ways: authorized user list or domain. If by authorized user list, your email must be included on their account user list. Note that institutional aliases are not recognized; you must be using the exact email address listed in the account. If domain authentication, you must use an email address with an approved domain (i.e., law.marin.edu). In either case, on Step 3 of the ExpressO submission process, the Review & Payment page, you will see an institutional credit applied (either partial or full depending on the account type). If you are prompted to pay and believe this to be in error, contact your Dean or Library, or you can contact us by email to expresso-support@bepress.com. We do not provide refunds or transfer charges. Which browers are supported by ExpressO? You can use any browser you wish to make your ExpressO submission, though we generally recommend using a modern browser, such as Google Chrome, Mozilla Firefox, or Safari. For Internet Explorer, we support versions IE8 and above. If you are using one of these IE versions, you may need to un-check your compatibility view (available under Tools in your File menu). How do I select law reviews? On Step 1 of the ExpressO submission process, on the Select Law Reviews page, simply check the box next to your desired law reviews. Law reviews are listed in alphabetical order – about 100 per page. Use the Next button to advance through the list. While you can also search by title and by the ExpressO Top 100 Law Reviews, which represent the most popular reviews chosen by authors, we recommend browsing by subject category. Selection by subject category allows you to choose law reviews that specialize in specific areas of law that closely relate to the topics covered in your manuscript. Once you make your selection, click Continue to move onto Step 2, the Article Information page. You can always revise your law review selection at any time during the submission process (not after) by clicking on the red Revise my Law Review Selection button. Some law reviews are greyed out. How can I select them? When a law review is greyed out and there’s no box to check, the law review is on temporary hold. This means the review is not accepting submissions, likely due to full volume. To see the complete list of reviews that are temporarily closed, please visit our temporary hold list. Note that if a review is grayed out but does not appear on the hold list, you may be submitting from an account that is associated with an ExpressO Institutional Student Account, and the law review is closed to student works (noted with Closed to students next to the review title). If you are a faculty member and not able to select reviews that are Closed to students, please contact us via email at expresso-support@bepress.com. Can I submit articles on behalf of faculty? Yes, the ExpressO admin feature allows you to use your own account to make a submission on behalf of someone else. On Step 2 of the submissions process, the Article Information page, under the Author(s) section, your account information is pre-filled by default. Simply click on the green plus (+) sign and enter the author’s email address, name, and institution. Then, remove yourself by clicking on the person icon with the red (x) next to your name so only the author is listed. Following these steps ensures the proper author is listed as the author of the paper, and all correspondence will be sent to directly to them. Is there a limit to the number of Subject Categories I can choose? While there is no limit to how many categories you can select, we recommend that you choose only those categories relevant to the topic of your paper, which is generally no more than 3 or 4. Should I remove my personal information from my article before submitting? Submissions made through ExpressO are not “blind” by default, meaning that the information about the author(s), their institution, title, and contact information are seen and shared openly to editors. This is true of the email notifications they receive of new submissions, as well as the posting of author submissions to their ExpressO accounts. In general, most law reviews do not use a blind workflow; however, those that do may take steps internally to strip any identifying author information from the full text article before sending to reviewers. We do not track which law reviews employ this method, or the workflows or the specific requirements of all of the law reviews listed on our service. However, if it is of concern, we recommend you submit your full text article in MS Word so editors can easily edit this information out if they wish. You can also check the submission requirements of the law reviews you’re interested in submitting to via their websites. The most common approach is to address your cover letter to “Dear Editors”. We do not mail-merge cover letters or individualize them. Whether or not ExpressO is used as the delivery mechanism, law review editors are aware that authors are submitting to multiple law reviews simultaneously. I'm making my submission but need to make some changes. Do I need to start over? The last step in the ExpressO submission process, Step 3, the Review & Payment page, allows you to review your submission metadata and make any revisions before sending. To revise any part of the metadata (i.e., title, subject categories) or upload a revised article, CV, or cover letter, click on the Revise My Submission button. Likewise, you can also revise your law review selection by clicking on the Review My Law Review Selection button. Click Continue to get back to the Review & Payment page. Although you can revise during the submission process, you cannot modify or edit once you complete the process and it has been sent to your selected law reviews. Why am I being prompted to pay if my school as an institutional account? If you are prompted to pay for your submission, you either logged in with an email address that is not approved by your institution (either not included on your institution’s list of authorized users or does not use an approved domain), or your school’s ExpressO institutional account may have a set submission credit limit. If you believe you are being prompted to pay in error, do not complete your submission. We neither provide refunds nor transfer charges. Please contact your institution or expresso-support@bepress.com. How long does it take to deliver my submission? All submissions are sent electronically and delivered immediately. Each law review you select for submission will receive an email notification and a copy of your submission is posted to their account. Will I receive confirmation that my submission was sent and delivered? Once you complete the submission process, you will receive via email an electronic receipt of your submission, including a list of the law reviews you selected. You can also view your delivery information through your My Account page, via the Manage My Submissions link. Note that if you substituted your account email address with a different author address while completing the Article Information page, your submission will only be available under the substituted address. For example, if you logged into ExpressO under your institutional address to make a submission, i.e., jane.author@law.marin.edu, but replaced this address with your personal email address under the Author(s) section, i.e., jane.author@gmail.com, the submission will be available in ExpressO under the jane.author@gmail.com address. When will I hear from law review editors about my submission? Law review feedback depends on a few factors, such as volume of submissions being reviewed and/or their policies regarding author communication. For example, some law reviews may not contact authors unless they wish to make an offer. ExpressO can only confirm the delivery and receipt of your submission to your selected law review(s). We are not involved in any editorial decisions or processes of the law reviews that use our service. All of the law reviews that use our service are provided a suite of free editor response tools through their accounts, including the ability to register a decision and/or send messages to authors directly through the system. While we encourage editors to use these tools as authors want to hear from them; it is ultimately their decision how and when they choose to respond to author submissions and inquiries. If you have not received a response law reviews regarding your submission, feel free to send status update request to law reviews. we offer post-submission tools to all authors, including Expedite, Email, and Withdraw options. Once complete the submission process, your submission cannot be modified. However, there are a few options available in case you need to make corrections. If the changes are significant, we generally recommend starting a new submission. This will allow you to include an updated CV and cover letter, as well as incorporate any changes that you may have made in your main text. This does require that you withdraw your initial submission before making a new one, so as not to confuse editors. Note that we feature integrated auto-withdraw, so if you do need to withdraw and make another submission, the previous submission no longer appears on the editor’s Manage Submissions queue. Of course, if the changes are minor, you may notify editors using the Email editors feature available via your Manage My Submissions page. How do I make an expedite request? You can send expedite request to one or more law reviews from the submission details screen. Select the desired law reviews, and click Continue (next to the Expedite option). Select the offering review in the My Current Offers section. Select your date and time in the Contact Law Reviews section. Note that the Response requested by date is the date you wish editors to send their decision. Note that time is also required, and must be entered in 12-hour format, i.e., 05:30, 12:30 (select AM or PM). To complete your expedite request, click Send. What are Preferred # of Simultaneous Expedite Requests? Law reviews set specific preferences that allow them to better prioritize expedites. This popular feature includes setting a preferred number of simultaneous expedite requests. For example, law review may set this number at 50, and then the author sends their expedite request to 50 or fewer law reviews, the request will be placed on the law review’s priority expedite list. If another author chooses to send an expedite request to more than 50 reviews simultaneously, that author’s request will not be tagged as priority. What is a certified offer? ExpressO certification simply means that ExpressO is able to confirm an offer that is made through our system. So, when an author makes an expedite request based on that offer, it is represented in the editors submission queue by a green check mark next to the expedite notification. The purpose of certification is to save editors from having to follow up with authors to confirm an offer is accurate and valid. If the offer is made outside of ExpressO, it is not certified, though that doesn’t mean it’s not valid. We then prompt the author to ask the offering law review to make that offer through ExpressO, as it not only makes it easier for authors to accept (a green Accept button appears in the author’s account), but it allows editors to easily track their offers through their accounts. Can I change the due date of an expedite request I submitted earlier? Yes. Simply generate a new expedite request to the same reviews to replace the previous request. The most recent request will appear in the editor’s view through their online account. Yes. From your My Account page, click on the Manage My Submissions link and select Withdraw from the drop-down box under Contact Editors. Next, check mark which reviews you wish to withdraw from consideration, and click Continue. Be sure to review your law review selection and click Send to complete the action. I'd like to know the status of submission. How do I contact editors? ExpressO allows you send correspondence to law review editors. On the Submission Details page of your submission, select Email from the drop-down box and click Continue. Modify the subject and body text before clicking Send. 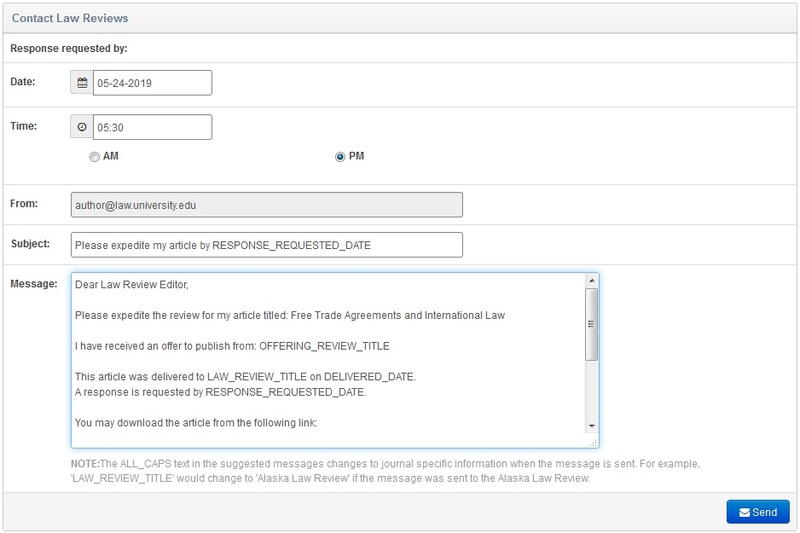 As an added feature, all of your correspondence to law reviews (expedites, withdraws, and general emails) generated through your ExpressO account is retained as part of your submission records. Simply click on the Details button under the Last Correspondence column. Can I resubmit the same submission to additional law reviews later? Yes. Click Make More Deliveries on the Submission Details page of your previously sent submission. No need to enter your submission metadata and upload your article, cover letter and CV again: simply select more reviews and submit.